It was only 3 years ago that Soundest was born to help small and medium-sized ecommerce businesses communicate with their customers. Our plan was to give smaller businesses the complex email marketing tools they needed, but to make it easy to use and at a great price. Interested in boosting your ecommerce success? 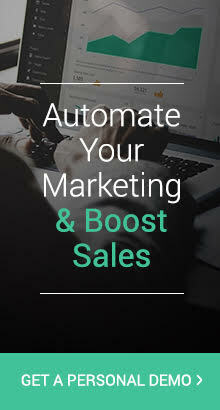 Connect your store today to see how Omnisend’s marketing automation can help you sell more. Sign up now for your 14-day free Pro trial. And, in our three years, that’s exactly what we’ve achieved. Soundest is now used by more than 30,000 brands in 130 countries all over the world, sending millions of emails every single day. However, as we were building features and planning our future, we realized that Soundest just wasn’t big enough anymore for all our goals. Our features have evolved to include more than just email marketing, and we’ve been steadily moving more towards omnichannel marketing, which puts the customer experience at the center of everything. Omnisend is focused on helping our customers, ecommerce merchants, to know their customers better and build stronger, longer-lasting relationships. This will enable them to know how to provide the most value to their customers or subscribers at the right time and in the right place. We believe that the only way to build a strong business in this new age of commerce is to build a strong relationship with your customer. That’s why we’re focusing on omnichannel marketing, so that customers can get the same unified experience no matter what channel is being used—whether that’s email campaigns, receipts, landing pages, popups, signup forms or interactive elements. Therefore, Omnisend places the focus on converting the visitors that come to your store and continuing a good relationship with them after they’ve made their purchase. 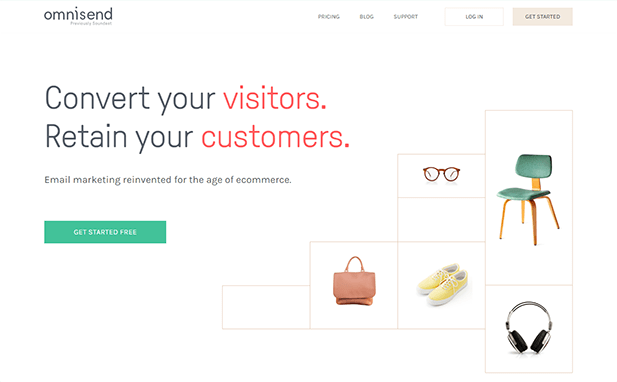 That’s the core of our message on our new homepage: Convert your visitors. Retain your customers. We want to help merchants build connections with their customers throughout the entire customer journey—from the first time they visit the store all the way until they make their repeat purchases. Omnisend really is focused on getting the merchant to better understand his customer. With our Signup boxes and popups, you can offer your store visitors an interesting offer, such as a discount or free shipping, in exchange for their email addresses. But you’re not just limited to their name and email. You can also add in any other important information, like their birthday, city, country, phone number, etc. The Wheel of Fortune offers your visitors a fun experience, while the Landing Page allows you to focus on a specific aspect of your store or product. With the right information, you’ll be able to know your subscribers much better, which will help you deliver the right message to them at the right time. Now that you have your customers’ email addresses, Omnisend can help you engage them with interesting features that help you stand out from the crowd. You can send emails using the Gift Box and Scratch Card features that will get your subscribers excited. You can also send a unique, randomized Discount Coupon Code to your visitors. Even better, it’s automatically synced with your store, so you don’t need to do anything else. 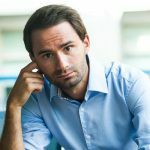 Keeping an eye on every single customer can be very difficult to do, but it’s often a great way to respond to them at the right time and with the right message. 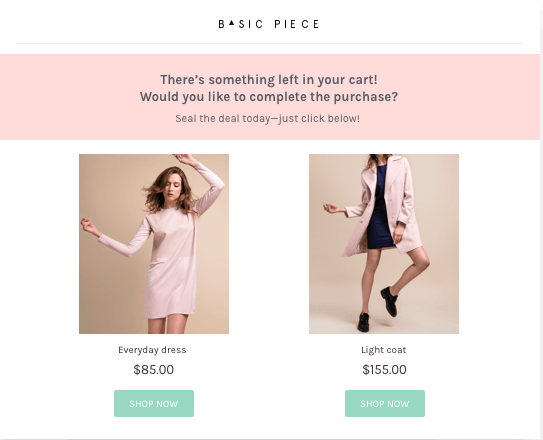 You can automate the entire process, so that any time your customer completes a certain action (like buying something or abandoning their cart), you can send them a customized email. Our Cart Recovery and Order Confirmation email will go out to your customers at the time when they need it most. You shouldn’t stop focusing on your customers once they’ve made a purchase from you. In fact, keeping them around for longer is much better for your business, since keeping a customer is 5-25 times cheaper than getting a new one. That’s why you need more features to re-engage customers who’ve gone quiet and keep the ones that just bought from you active for longer. Our Order Follow-up email allows you to ask for customer feedback after they made a purchase and even inspire them to buy from you again. Our Customer Reactivation series goes out after a certain amount of days and contains offers like free shipping or discounts to get those customers back. When you get down to the basic definition of commerce, it’s essentially about the exchange of value. With better and smarter features, we can help you create this constant exchange of value throughout your entire relationship with your customer. And we’ll be able to do that without having to change our pricing, so you don’t have to worry—you’ll be paying the same rates as you always have. But the biggest change you’ll see—something which has, in all honesty, started a long time ago—is our explicit guidance to help merchants put their customers at the core of their business. We firmly believe that only by building up a relationship with your customers will you be able to build any kind of long-term, sustainable business. After all, we heart our customers, and we want you to heart yours. See what Omnisend can do for your ecommerce business. Connect your store today to get your 14-day free Pro trial. Rytis is the CEO and Co-founder of Omnisend. 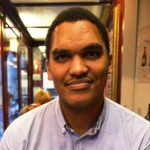 He's passionate about email marketing and is always looking for new ways to help ecommerce businesses achieve greater results. The one major thing you need to add is a link with Facebook ads so that our customer lists can become audiences in Facebook. Your main competitor ‘k’ has this and its the only reason I use them to be honest! I prefer your program for everything else because of the simple ways to create emails with products, gif animated videos from youtube, followup emails, popups… youve got it happening! But having the ability to create audiences in Facebook based on what they have bought at our store is vital. eg. Bought X but not Y… we can then market them Y.
Omnisend – you can make it happen and then you will Omniawesome! Thanks so much for your comments! The feature you mentioned – the ability to use customer lists for Facebook ads – is definitely on our roadmap and is one of the many new exciting things we’ll be working on here at Omnisend. Congrats on the rebrand guys! I agree with Brian on that feature as well. Although there is one feature of yours that is a very simple fix but hasn’t been fixed yet and it’s to do with the wheel of fortune…. The problem is that if you include the NAME and EMAIL fields, when the wheel pops out, there is no “NO THANKS” option visible to the user. This is a serious usability flaw because if the user doesn’t want to do the wheel and they can’t see a close button or a NO THANKS option, they will press the BACK button on their phones… this won’t take them back to the screen they were on but BACK to the previous website they were on (which is usually facebook). When they do that, you’ve lost a potential sale! Having the wheel installed without a HIGHLY visible close button is a really really big concern and I had to stop using it on my store for this one reason. People were bouncing and I couldn’t understand it at first, until I actually watched hundreds of people do it on my screen recording capture. Please please please can you make the NO THANKS button highly visible and mobile friendly? All the other wheels have highly visible close or NO THANKS buttons – Spin a sale / Wheelio / Privy except for the Soundest one. Please please please fix and it’ll be a tool Id love to start using again! Thanks guys and looking forward to the new features coming soon! Thanks for the feedback Guy! We’ve taken your request straight to our team and I’m glad to say that it will be available in just a few short weeks! If you’d like, we can send you an email the day that it becomes available. Exciting times and a great app that we use with our Shopify store. Your team is always really helpful and a pleasure to deal with. One feature we are keen to see is customer segmentation which was mentioned in your roadmap about 6 months or so ago, any news on a date for this? Thanks for getting in contact with us. As you know, we’ve been working hard to keep our promises made on our What’s Next plan (https://www.omnisend.com/whats-next), and this one will be no different. Segmentation will be available this year in December. If you’d like, we can send you an email when that feature becomes available. Cant wait for the new feature!